We all know that the Galaxy Note is a big phone. Samsung has been very proud of their Note series and have considered it a great complement to their flagship Galaxy S series. 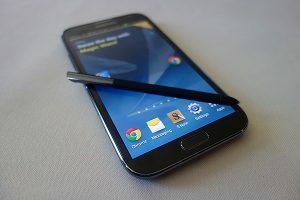 Even though the Note 2 has already been released and reportedly had commercial success within the first month of its release, rumors are already starting to pop up regarding the Galaxy Note 3. The iconic characteristic of the Note is its massive screen. The first had a 5.3 inch screen and the second had an even larger 5.5 inch screen. The large screen warranted the coining of the term phablet. And should this rumor from the Korea Times hold true, the term phablet will be even more legitimized. The rumor states that the Galaxy Note 3 will sport a whopping 6.3 inch screen. This would bring the phone awfully close to some of the 7 inch tablets that are currently on the market. Now it is possible that Samsung may increase the size of the screen even further in the Galaxy Note 3 as it did with the past iteration, but it may be a stretch to say that it will increase by almost a full inch. There is such a thing as too big. In my honest opinion I find the Note too big as it is now. I prefer a phone more akin to the size of the iPhone or the Galaxy S3. A 6.3 inch screen would not be the most comfortable thing to hold or to carry around in your pocket. However, Samsung may do what Apple did with the iPhone 5 and make the phone taller as opposed to wider so that it still fits comfortably into a consumer’s hand. This is still all early speculation, but we will keep you updated on any information about the Galaxy Note 3.